Alexandar Georgiev has been great in calendar year 2019. 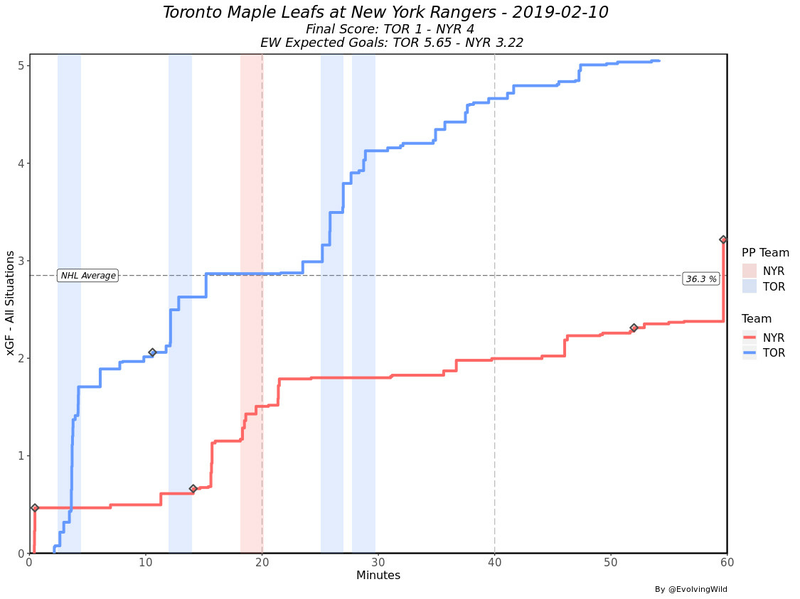 Another strong performance vs. the Toronto Maple Leafs on Saturday, his latest start, only complicates the decision the New York Rangers should will have to make with their goaltending situation for 2019-20. I went into detail at the beginning of the month on the impact Igor Shestyorkin’s arrival could have, and why when he comes to North America he should have every chance to win the backup job. 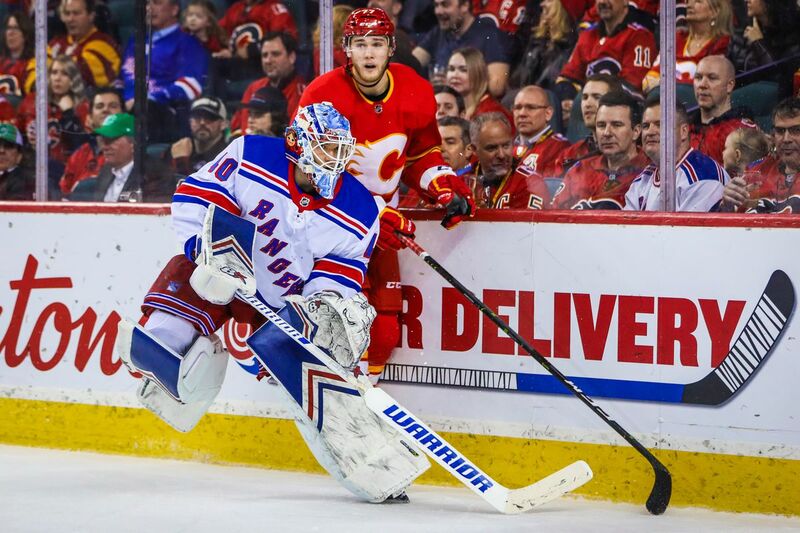 Since writing that story I have done some more digging on the Rangers’ current backup, Georgiev, and how he’s played, and how it highlights the tough decisions the team has to make with their netminders. It was once an obvious decision on how to proceed, but now it may make more sense to hold onto Georgiev a little longer to get a sense of what he is, while reserving the right to trade him/demote him if Shestyorkin is as good as advertised. Georgiev’s made 18 appearances in 2019 and the remaining 20 have gone to Henrik Lundqvist. Since Georgiev played just 10 of the Blueshirts’ first 39 games, it’s a challenge to really evaluate him because he was rarely able to get into a rhythm and was often stopped and started a few times. So, with that in mind, we’ll focus on his starts in 2019. The Blueshirts have eight games left in the season, and I would expect Georgiev to get at least three more starts, if not four so that it is 50-50 split down the stretch. In his 18 games played in 2019, Georgiev has an all situation save percentage of .914 and Goals Saved Above Average (GSAA) of 1.72. At 5v5, he’s earned a .916 save percentage and -1.56 GSAA. He’s faced 428 shots and stopped 392 of them. Of those 428 shots, 139 rated as high-danger; he’s stopped 119 of them, earning a .856 save percentage. He’s also faced closer shots on average than Lundqvist at 5v5, as the average shot distance is 35.54 feet away whereas Lundqvist is 37.44 feet away. 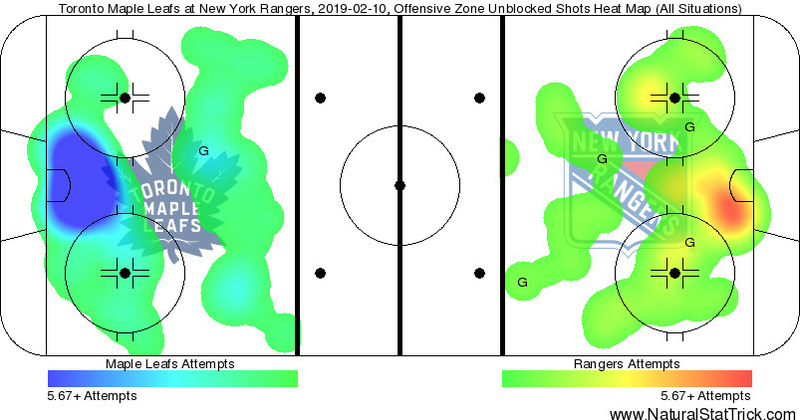 The accuracy of this is dependent on the NHL tracking shot location correctly, but the point is that based on available metrics, the Rangers are letting teams get in closer vs. Georgiev than they are with Hank. If you expand to all situations, for context, Georgiev faces shots from 34.90 feet away on average and the average distance of goals he’s allowed is 22.45. Lundqvist, on the other hand, faces shots at a distance of 37.87 feet on average, and his average goal distance is 25.83 feet. So what does all of this mean? The immediate answer is that although Georgiev has played 151:36 fewer minutes in 2019 than Hank, he been very busy and tested often. He’s been able to hold his own, and although it is a small sample he is showing at the very least he may be a competent NHL backup who can handle a decent share of games. 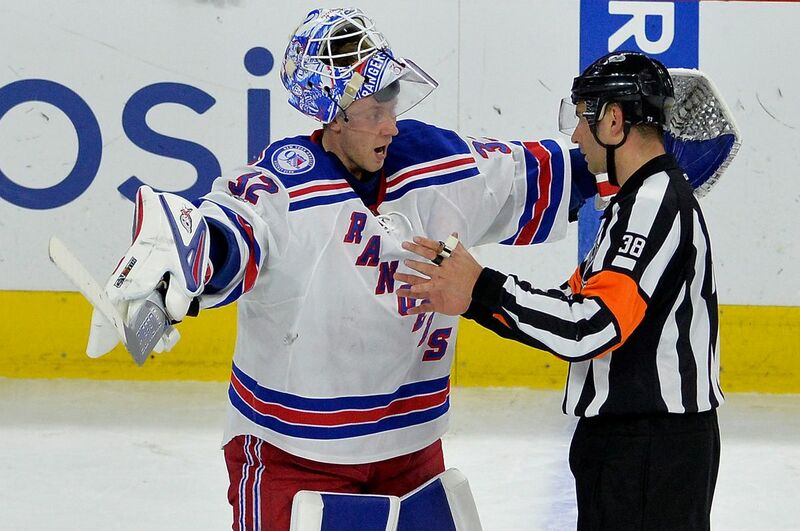 The Blueshirts were victorious on Saturday vs. the Leafs, and by all accounts they should have been blown out. Here’s two charts from Evolving-Hockey which highlight that. And here are two from Natural Stat Trick. In this game Georgiev faced 34 shots 5v5 and here’s a breakdown of saves by strength. The average shot in this game was from 39.50 feet away, and Zach Hyman’s goal was scored from 16 feet away. 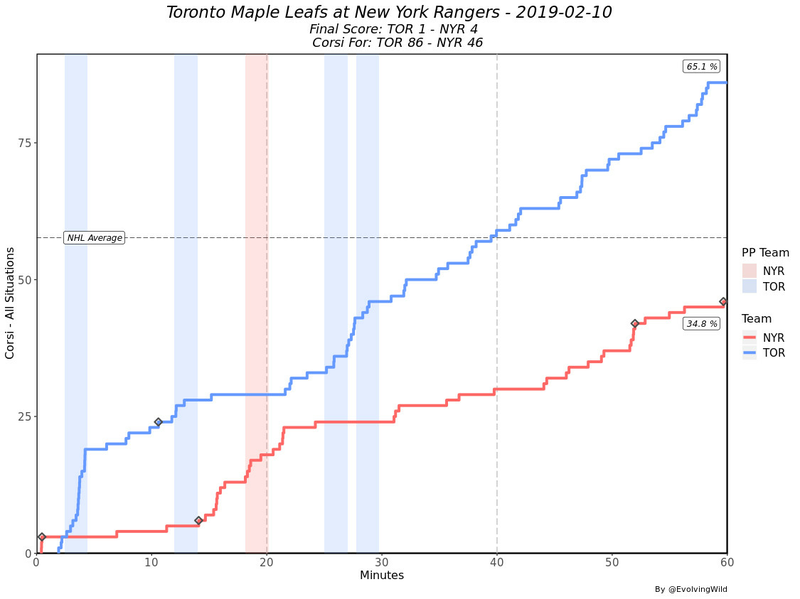 This was the second time this season that Georgiev rose to the occasion against Toronto, as the Leafs became flummoxed after firing 56 shots on net and just scoring once at Madison Square Garden on February 10th. Once again, here’s the charts from Evolving-Hockey. And two from Natural Stat Trick. On Feb. 10, Georgiev faced 28 shots at 5v5, and here’s the breakdown of saves by strength. The average shot distance and goal distance isn’t include here because there were some issues with shot location for this game. 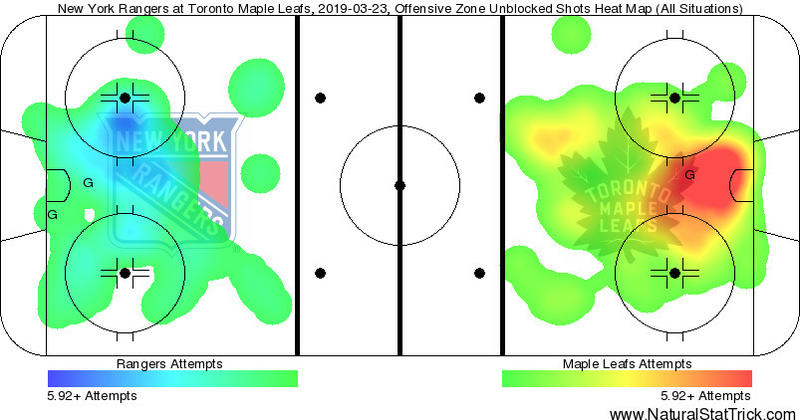 But the fact remains though that the Leafs once again were controlling play, and the heat maps tell a pretty interesting story. Georgiev was a difference maker, and it was another high profile victory on Hockey Night in Canada added to his resume. Since expansion (1967-68), Alexandar Georgiev is the first #NYR goaltender who has posted two 40-save wins against one opponent in the same season. The last point that is important to mention with Georgiev is how the team has looked in front of him vs. that of Lundqvist. This chart shows how the Rangers generate shots for (top) with each goaltender in net, and how they allow shots against (bottom). 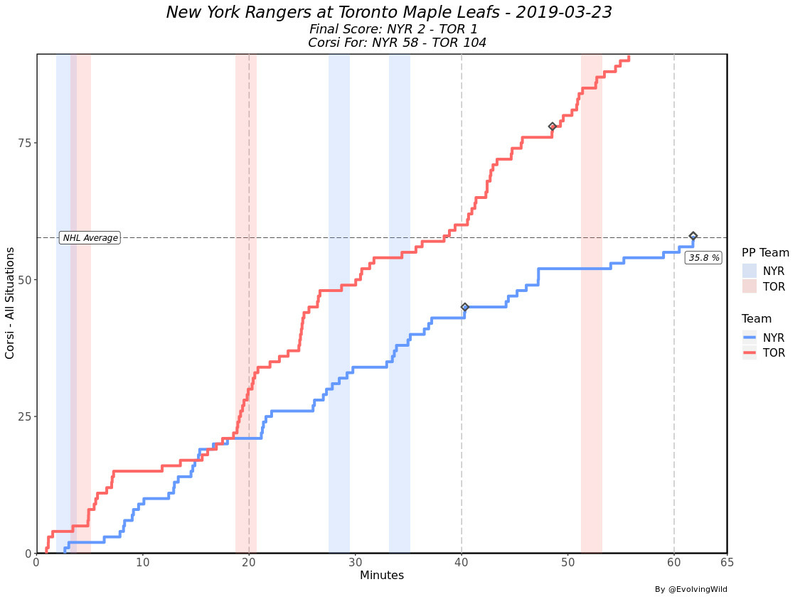 With Lundqvist in net, the Rangers are slightly better at generating offense in front fo the net, but with Georgiev, they’re creating even less. 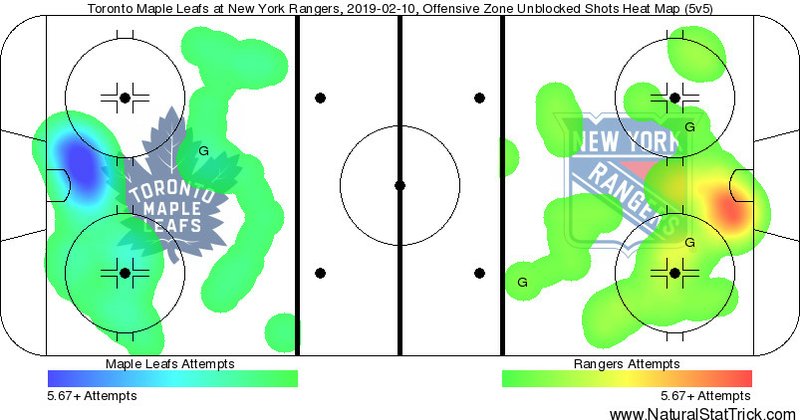 When it comes to shots against, the Rangers defense is forcing teams to different areas of the ice with Lundqvist in goal, but with Georgiev it is impossible to miss the great red splotches all around the goal and between the hash marks. The obvious thing here is that the team is bad, and Lundqvist has more of a sample with the team pre-deadline which obviously impact the results. But if the Rangers stay the course with the rebuild and refrain from making significant adds, these results should be expected next season as well. 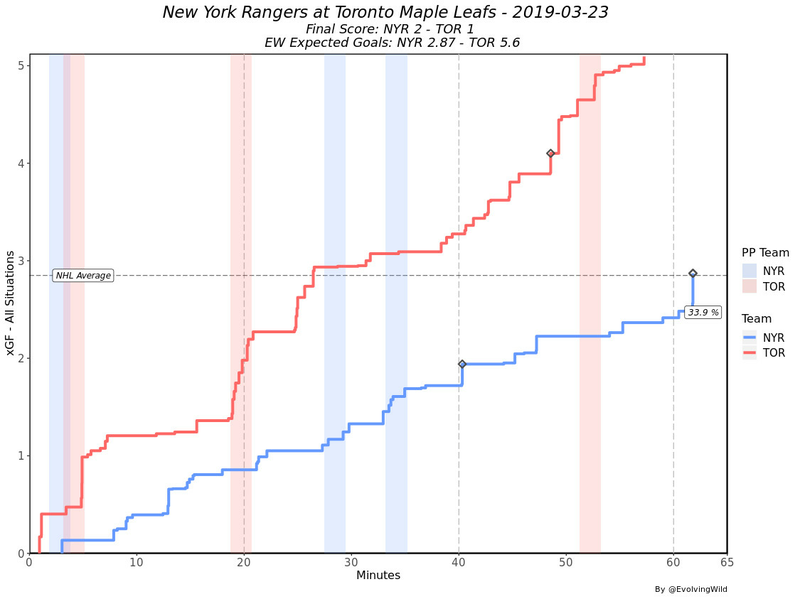 The reason I include charts like this and the ones above is because they give a better insight of what Georgiev has done, and what he’s had to deal with. An average fan could go on NHL dot com and see he’s got a record of 11-12-3 with a 3.02 GAA and a .909 SV% and assume that he’s a bust of a goalie. They could do the same looking at his AHL stats this year in which he posted a line of 2-9-0 with a 3.66 GAA and .833 SV% this year, and a line of 14-13-7 with a 2.98 GAA and .909 SV% last year. But there’s more to his career to date than any of that shows. The phrase “goalies are voodoo” is one thrown around a lot because it is hard to pin down what you are going to expect for the most part. 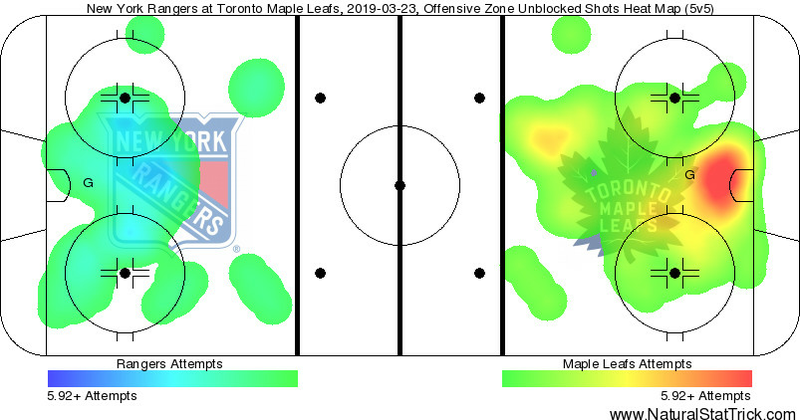 In Georgiev’s case the charts help explain to a degree why he can have a performance like he did Saturday vs. Toronto while also allowing five goals on 32 shots vs. the Flames. In terms of value, of all goalies to appear at least 10 games this season, Georgiev has the 16th lowest cap hit, and when you divide that by the amount of games played, he has the eighth lowest cost per start at $28,303.57. The Rangers have a history of developing backups and trading them, and to date is hasn’t really burned them. Cam Talbot had mixed results as the Edmonton Oilers’ starter (but then again, look at the team that was around him), and injuries have limited Antti Raanta to just 59 games with the Arizona Coyotes. He’s show a lot of potential, and if he can stay healthy there’s a chance he does some amazing things. The Rangers have a glut of goalie prospects in the system — Shestyorkin, Tyler Wall, Adam Huska and Olaf Lindbom just to name a few — and they have the depth to consider dealing Georgiev. One way or another they could end up being without him soon, because there’s a good chance he could be lost in the expansion draft. Roughly two weeks ago the Seattle Hockey Analytics conference was held, and Georgiev was the most popular Ranger selected in the SEAHAC expansion exercise. Georgiev is a fine backup who has responded well to the slight increase in playing time. There is no way of knowing if he will ever be a full time NHL starter who plays in more than 50 games a season, but the Rangers should be selling teams on his potential and results to date. In the Shestyorkin story I looked at Andrei Vasilevskiy as a goalie with more of a pedigree than Georgiev, and one who played well in the AHL, decent in the NHL and then initially struggled with the increased workload before coming who he is today. Georgiev isn’t Vasilevskiy, but the Rangers theoretically could give him more starts next season, and he could struggle, so there’s something certainly to be said of trying to sell high in the event he’s a paper tiger. Conversely he could play well and complicate matters even further. We don’t know if that’s the case, and that only reinforces how delicate the tight wire the Rangers are walking is. Shestyorkin by all accounts has the inside track when it comes to succeeding Lundqvist as the team’s starter because of his skill set and potential. He’s received accolades from many scouts and projects to be a good NHL starter. If that comes to fruition, getting an asset for Georgiev would be better overall for the rebuild than having him be the Hartford Wolf Pack’s starting netminder in 2019-20. There is always the chance the team holds onto him and waits to see how both goalies perform, assuming Shestyorkin is in the NHL, and then moves Georgiev during the 2020-21 season to a team that needs to address an injury, but moving him at or before the draft could be the best way to maximize the return and minimize the risk of his value sliding. Had Georgiev received more playing time after last season was lost, and more time this season, the Rangers would know more about him to make an informed decision. Goalies are in fact voodoo, so I don’t envy the decision Jeff Gorton may have to make this summer. Stats via Cap Friendly Evolving-Hockey, Hockey Viz, and Natural Stat Trick unless otherwise noted.